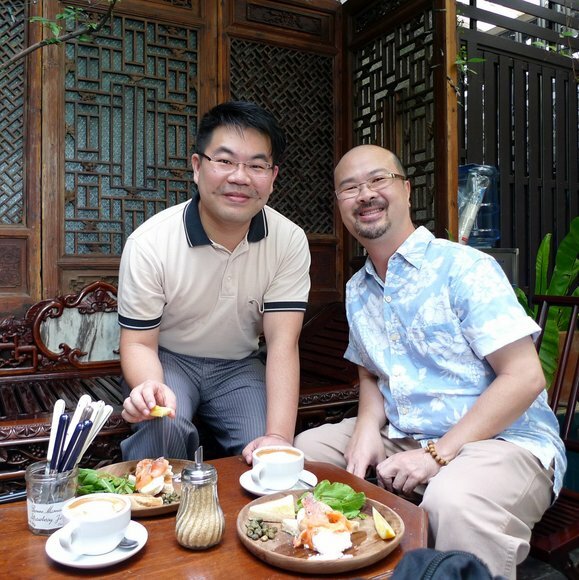 This weekend we enjoyed a return visit by David and Chor Pharn, a Singaporean couple who make frequent visits to Bangkok and whose presence at our dining room table made for a very pleasant Sunday brunch and garland making exercise. We met the two (Chor Pharn is on the left, above, and David is on the right) through another couple we know from Singapore. In fact, since I met my first Singaporean while in university I’ve learned that once you know one, you soon seem to know nearly all of them. Sure enough, once I met Yuen Ping, I met Otto, then Han, then David and Chor Pharn, and the list cascades from there. Not to mention another two strings’ worth of Singaporeans, most of whom seem to know each other or, at the very least, know of each other. It’s a small island, after all. Having them over for brunch gave me a chance to try some new recipes, continuing to refine an easy-to-prepare brunch menu that doesn’t require me to slave away in the kitchen while guests are here. 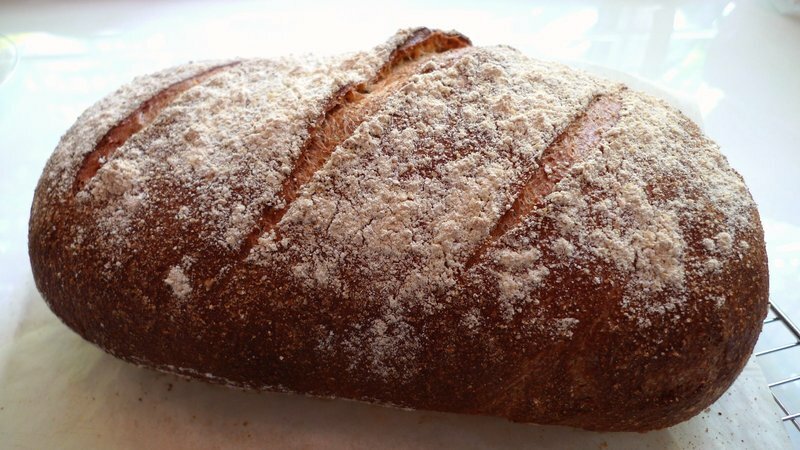 Above, a beautiful loaf of homemade bread. 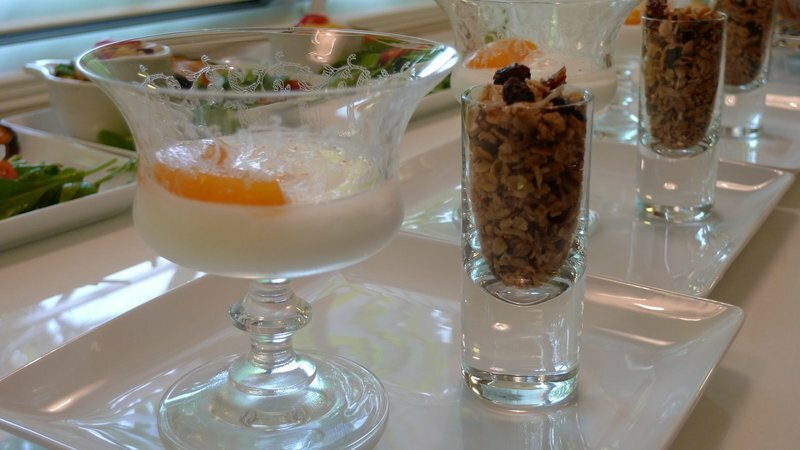 As an amuse bouche, I prepared some homemade muesli, served with unsweetened Greek style yoghurt with a slice of canned peach and drizzled with some peach syrup. Tawn insisted on using his ice cream goblets that he hand-carried back from Paris. The coffee was some of the 100% Kona beans I brought back from our March trip to Hawaii. Perfect for a French press. 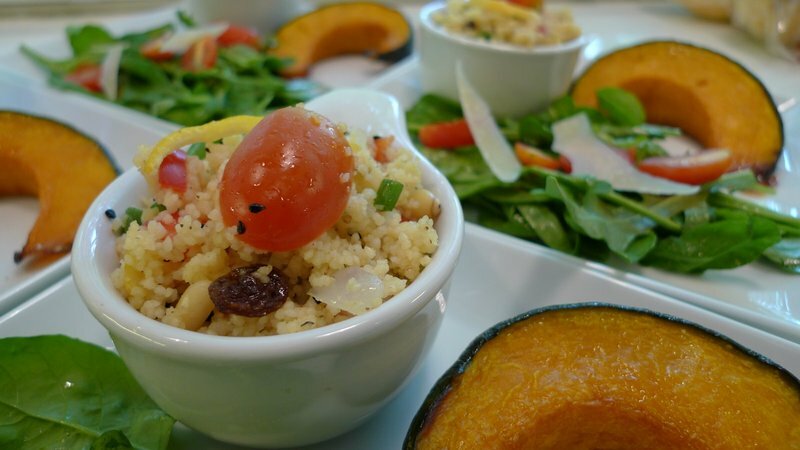 From there, we enjoyed plates with a trio of room temperature tastes: a couscous salad with mixed vegetables, pine nuts, raisins, and homemade preserved lemon rind; over roasted Japanese pumpkin glazed with Canadian maple syrup and a sprinkle of black truffle sea salt; and a mixed salad of rocket (arugula) served with a rice wine vinaigrette, shaved Parmesan cheese, and cherry tomatoes. 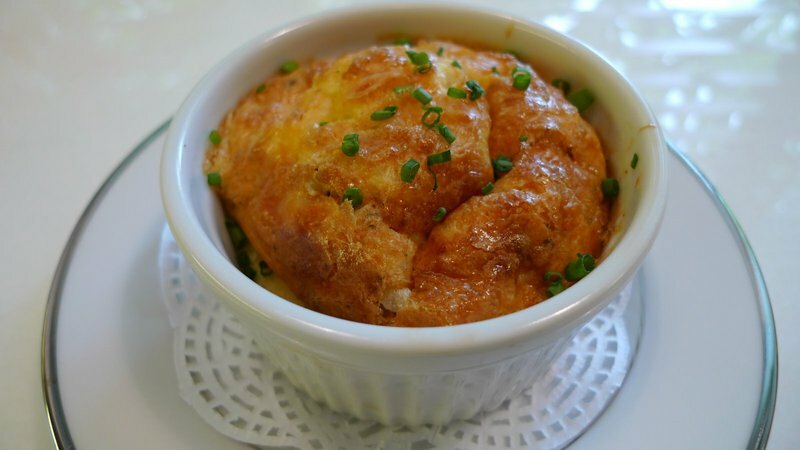 The warm dish was individual baked egg souffles with sliced pork loin, onions, and jack cheese. 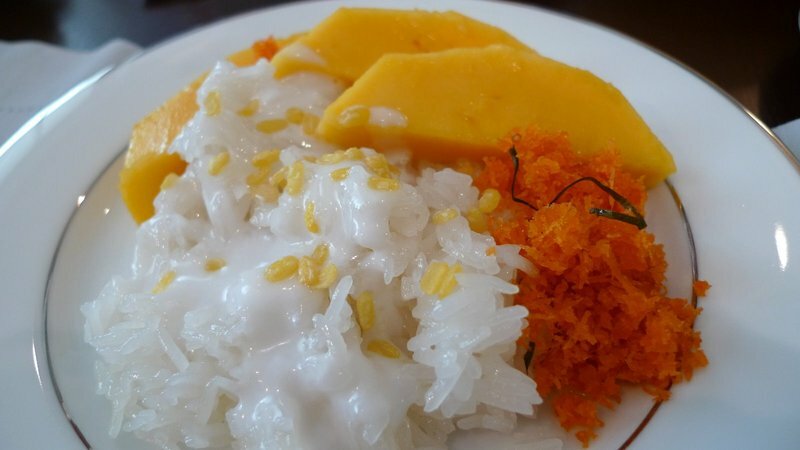 For dessert, we had khao niaw mamuang – sticky rice and mango. Mangoes are very much at the peak of their season right now. The garnish is na gung – a shredded coconut that is flavored with shrimp, palm sugar, and kaffir lime leaves. This may not sound so good, but once it is cooked it becomes the perfect, slightly savory counterpoint to the rich, starchy sticky rice and sweet mango. 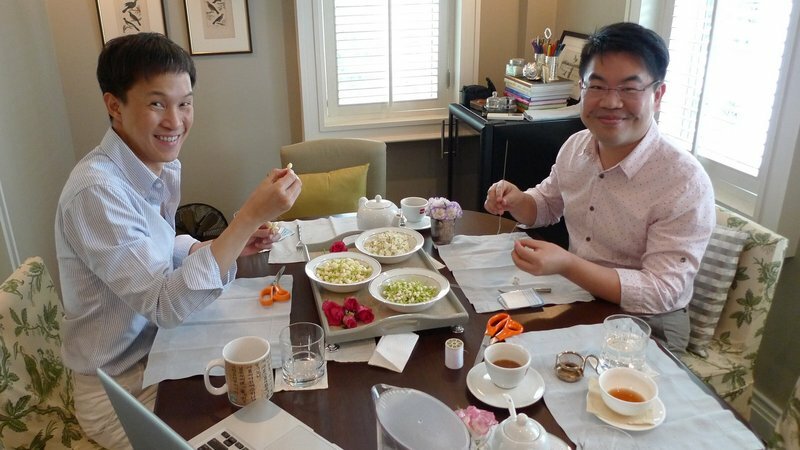 After lunch, Tawn and Chor Pharn set up the table to try their hands at an activity that has caught CP’s curiosity: making floral garlands, called puang malai in Thai. (Literally, “bunched together jasmine”.) 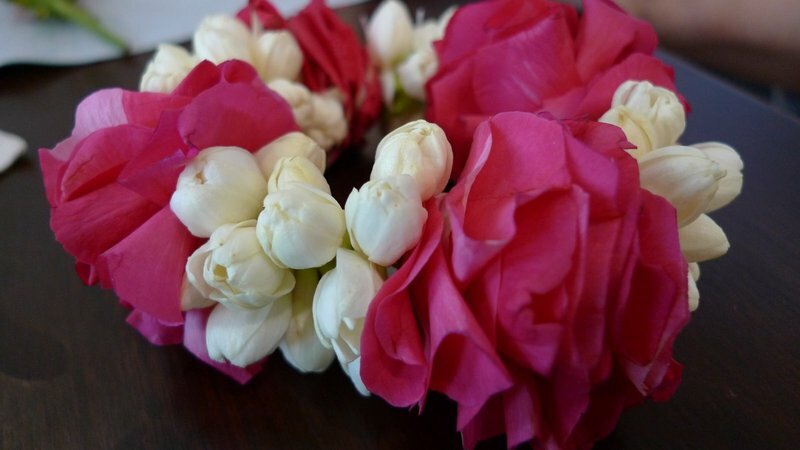 Used as objects of decoration as well as veneration and welcome – left at shrines or statues, given to teachers, parents, respected elders, and visitors – the puang malai are made of small, fragrant flowers threaded onto a string using a long and very sharp needle. The above image is taken from Sakul Intakul’s book Dok Mai Thai: The Flower Culture of Thailand. Khun Sakul is one of the masters of the Thai floral arts, an engineer turned floral arranger, and his book illustrates the beautiful designs he creates. Tawn and Chor Pharn get ready to start, while David and I try to document the occasion and stay far away from the long needles. 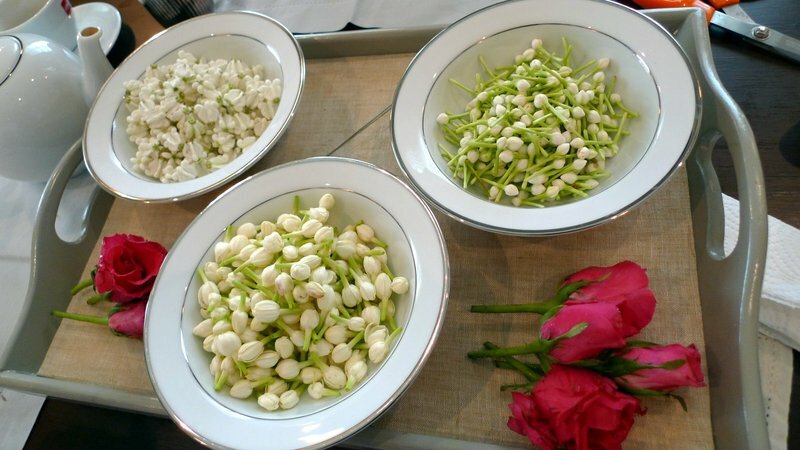 A quartet of blossoms: in addition to roses there are, from the left, dok rak (love flower) which is a very sculptural form of jasmine, dok malik (the highly fragrant Arabic jasmine), and dok put (talk flower) also known as gardenia. 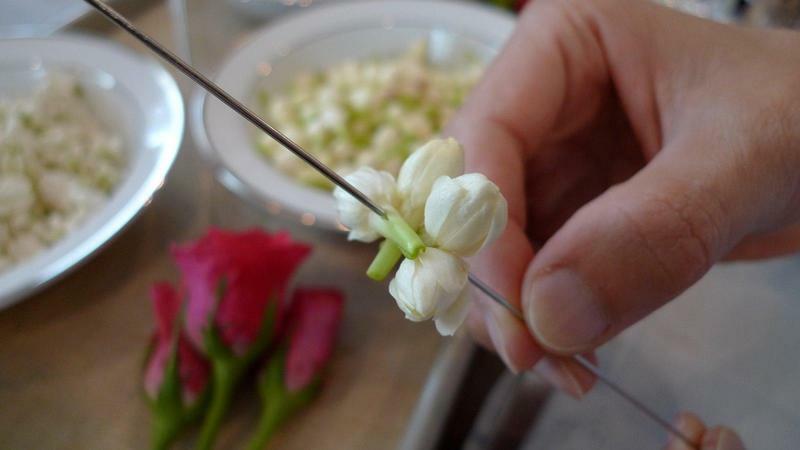 Tawn starts arranging the jasmine blossoms in a rotating pattern. After you get a group done, you thread it onto cotton string. 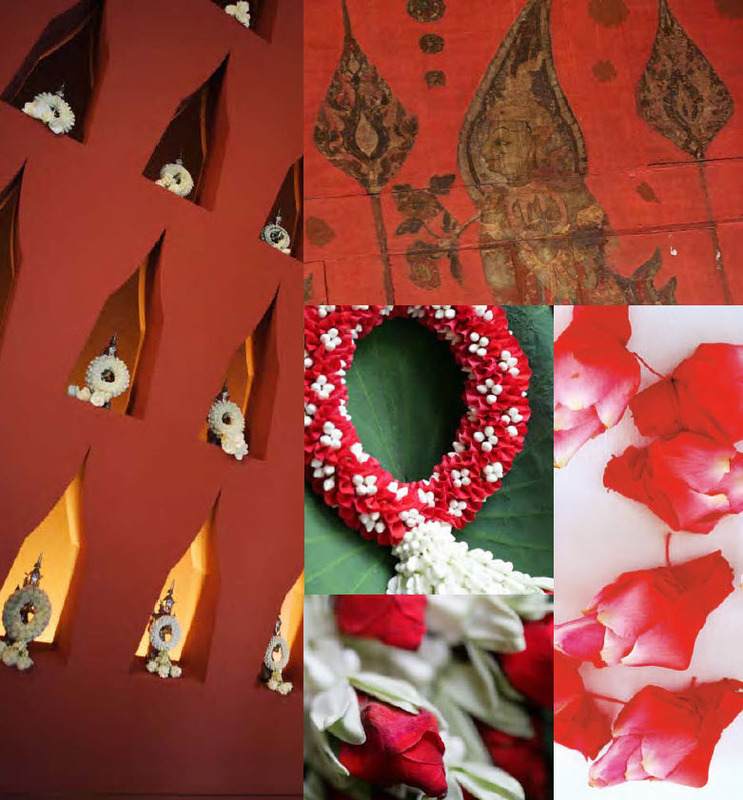 Traditionally, though, you would use a thread made of banana leaf. A close-up of the progress, with rose petals folded in half, speared by the needle, then trimmed into shape with scissors. The work ended up being quite a bit more tedious that expected. When you watch the vendors at the side of the street you mistake their speed and dexterity for the task of making a phuang malai being easy. It turns out their speed and dexterity is a result of their skill and experience and they make an intricate art look deceptively simple. This entry was posted in Uncategorized and tagged culture, Dok, Dokmai, Flower, Garland, Jasmine, Malai, Phuang, thai, Thailand by christao408. Bookmark the permalink. That is so neat! What a nice time! 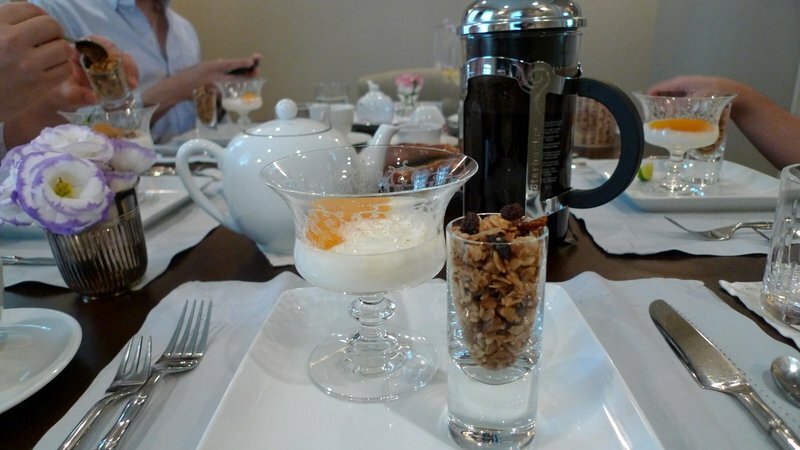 Such a nice brunch presentation! I still remember the fragrant scent of those jasmine garlands during my prior visits. So nice! Once I start working… I want to visit and get brunch :]As for the Jasmine Garlands… they’re beautiful… I don’t think I’ve seen them before. Kona Coffee!!!! And all that great food. You may have a second career in catering. Add the garlands and a beautiful brunch. I feel like a bad gay for not using pretty dishes when serving. that brunch looks amazing. and the garlands look like too much work! hahaha the last time i did anything like that, i was making ribbon leis for people for graduation presents. time consuming, but at least your fingers don’t get sticky from the flower sap! i haven’t sewn a flower lei in many years. WONDERFUL BRUNCH. You know what? The Indian Alfonso mangoes I got from the distributor in Chicago were very sweet and tasty, without any fiber. Yesterday I got a dozen huge mangoes from a friend in Chicago, not as sweet as the Indian one, but pretty good. Chris, I can smell the heady fragrance of the jasmines through your pictures. You have teased the nostalgia big time. I used to sit at home and make those maalais, along with the servants. This was a beautiful post to read. Thank you. Your table setting is gorgeous,so elegant,all the food is beautifully served. The Japanese pumpkin is mouth watering. The table is so beautifully appointed – I’d not want to disturb anything that would ruin the look… The garland making is interesting. How big were the final products?? totally miss the mango and sticky rice! Wonderful post! Looking at the food makes me so hungry, and the flower garlands are so pretty! Everything from the food, to your house, to how you all dress looks incredibly fresh and neat! How did you manage to have everything so beautiful? It’s like a magazine spread haha. homemade müsli??? i want!!!! hohoho i have my ever first müsli in Frankfurt 2weeks ago and i am loving it!!! @secade – I hope your next job allows you to visit Thailand, too. You’re always welcome. @lcfu – It took you that long to discover Muesli? @stepaside_loser – The benefits of getting older, Andrew. =D@aPieceOfTheSky – Glad you enjoyed it. @godisinthewind – Maybe it is time to get a publicist! =D@jace1982 – Yeah, wish I could pack up some and send it to you! @murisopsis – They range is size but the normal ones are about a foot in circumfrance with two six-inch tails. @seedsower – Oh, thank you very much for your kind words. @ZSA_MD – Thank you for the recommendation. After Chor Pharn walked in with the bags of flowers, the whole house had that jasmine aroma! @kunhuo42 – Thankfully, these flowers didn’t have any sap, but I’m sure you can appreciate just how time consuming such an activity is. @Wangium – “A bad gay”?! Ha ha! I don’t think you’re in any danger of losing your gay card because you don’t use pretty dishes, Jason. Tawn was laughing about your comment, too. 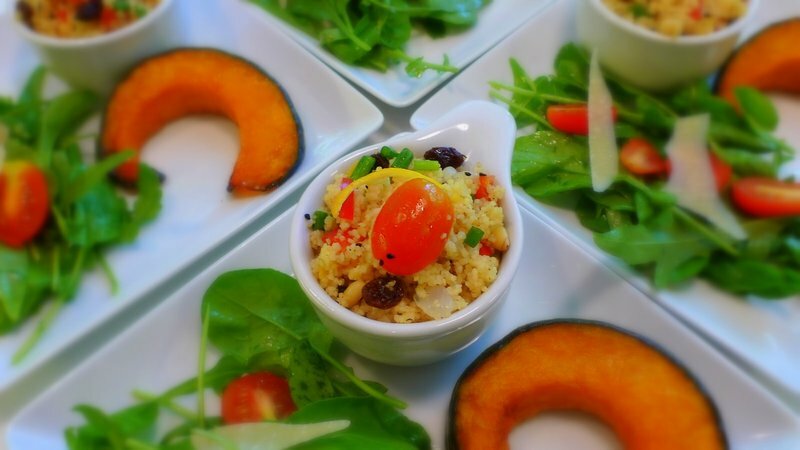 @Fatcat723 – The only catering I want to do is to consume the catered food! Too much work, otherwise. 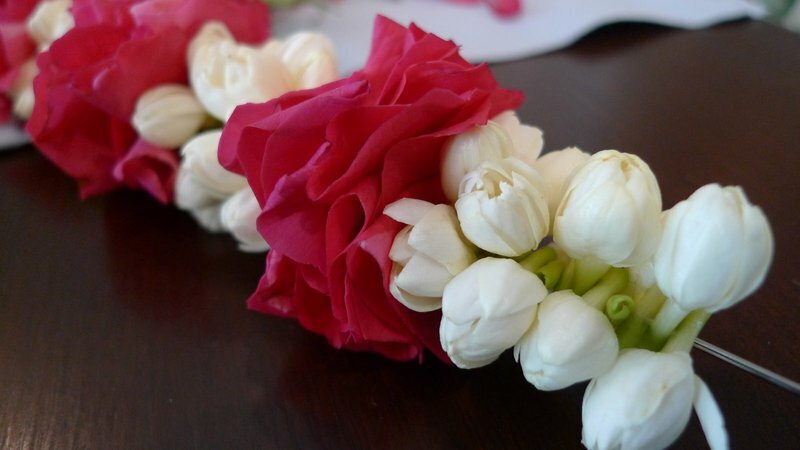 @Devilzgaysianboi – When you visit Thailand, we’ll show the garlands to you. And brunch, too, of course. @CurryPuffy – Consider this a preview, Gary. @yang1815 – It was fun. I think Sugi would have enjoyed it greatly. @kimmyisgone – Oh, yes, it was! @christao408 – I think so too. Oh gosh, I missed this entry. You guys really know how to entertain in style. If I was eating out of those goblets and I knew Tawn hand carried them from Paris, I would be shaking in fear. What if I broke them? That’s the ultimate sin…I join Jason in feeling like a bad gay for not knowing the basics of entertaining. I’d probably would just have those take out packages of soy sauce, hot sauce, catsup etc.. out there with my plain ol’ white dishes. Are there remedial courses for gays like me? @ElusiveWords – There are. Private sessions hosted in Thailand. When shall we make an appointment for you?